If there was ever a time to stop by a farmers market or join a CSA, this is it. Sweet corn, zucchini, eggplants, peppers, basil are cheap and plentiful and so much better than the sad plastic-wrapped versions you’ll find at Trader Joe’s. And because everything tastes so good, it takes almost no work to turn it into a quick grain-based salad full of bright colors and crunchy-chewy-soft textures. My obsession with grain salads has been going strong for the last couple years, to the point where I actually have to tell myself, Do NOT make a grain salad! when pondering my dinner options. I can’t help it: they’re quick, adaptable, easy to load up with vegetables, and make good lunch leftovers the next day. You can eat them warm or cold. You can eat them in a house. You can eat them with a mouse. Box, fox, here, there, anywhere. I love them. This particular salad uses a little of everything from my late-summer vegetable drawer, mixed with a lemon dressing made with avocado oil. The zucchini is prepped in my favorite way: sliced into shreds and tossed with salt to draw out some of the moisture, giving it a ton of flavor and a still-crunchy texture. The corn is cooked in its husk in the microwave, a new-to-me method that takes less than 5 minutes and has replaced my usual boiling-water bath. And the grain I happened to have on hand is an odd find — pearled farro, which is a quicker-cooking (and less nutritious) version of farro, a type of wheat. I didn’t have a full cup left when I made the salad for these photos, so I supplemented with some quinoa. Feel free to use whatever grains you have on hand, though the size and texture of grains like barley and farro seem particularly well-suited for this combination. Play around, use what you have on hand, add a little crumbled feta cheese if you’re feeling crazy and watch out. Because you just might get addicted to grain salads too. 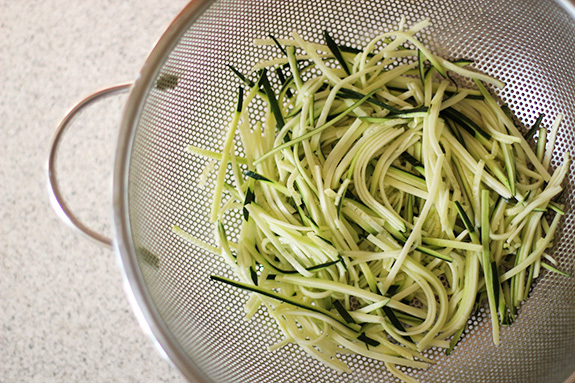 Trim the ends off the zucchini and cut in half crosswise. Finely shred with a mandolin or a sharp knife and place in a colander. Sprinkle with ¼ teaspoon salt and mix in thoroughly with your hands. Set aside for 30 minutes, or as long as it takes to finish assembling salad. Bring a small pot of water to a boil over high heat. Add a generous pinch of salt and the farro. Lower heat and simmer, stirring occasionally, until grains are cooked through, about 15 minutes. Drain and set aside in a large mixing bowl. Meanwhile, make the dressing: In a small bowl, whisk together the lemon juice and remaining ½ teaspoon salt. Drizzle in the avocado oil, whisking continuously. Pour about three-quarters of the dressing over the warm farro and mix. Set aside. 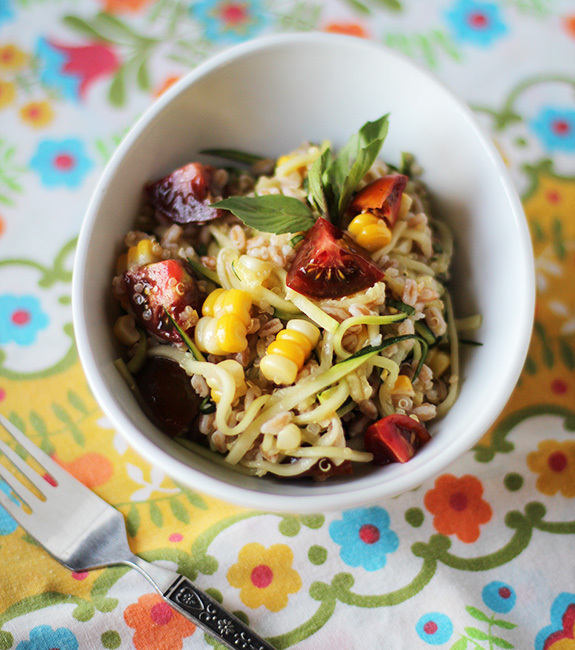 Cut the corn from the cobs and add to the farro. 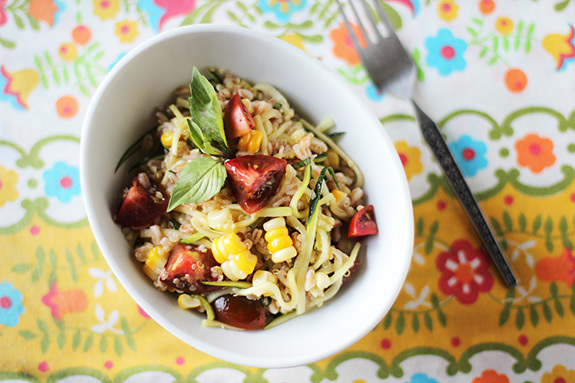 Lightly squeeze the zucchini to get rid of excess moisture and add to the farro as well. Drizzle with the remaining dressing and stir. Let mixture sit, stirring occasionally, until grains are warm but not piping-hot. Add the tomatoes and basil and mix. Taste and adjust seasoning. Serve warm or at room temperature. • Other grains like pearled barley, quinoa, regular (not pearled) farro or brown rice can be used in place of the pearled farro. Adjust the cooking time as needed. • If you don't have avocado oil, you can substitute extra-virgin olive oil. 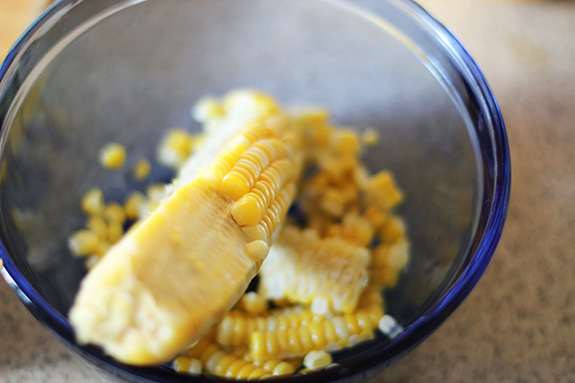 • The quickest way to cook corn on the cob is to microwave it. Microwave in the husks for about 2 minutes per ear. Let cool slightly, husk and proceed. Easy! OMG, THANK YOU! “The zucchini is prepped in my favorite way: sliced into shreds and tossed with salt to draw out some of the moisture, giving it a ton of flavor and a still-crunchy texture.” I never understood why directions said to do this, and I never knew how to get things crispy! Boom! Hi Marie! Yes, grain salads are a whole new world of starchy that I think you’ll like. These are really mouth watering, simple, and must try recipe. I really loved this very much. Thank you so much for sharing this here. I will definitely try these recipes this weekend for sure and will sure my opinion about this very soon. Keep posting such healthier and must try recipes. But information given related to it also has its own importance and we should not ignore it.